I made these recently for a client who had a small dinner party and wanted an appetizer that was pretty, healthy and not too filling. 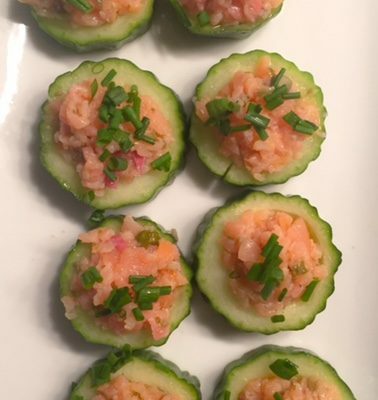 Easy to make ahead these cucumber cups can be filled with a variety of things such as herbed chèvre, cream cheese with chives, smoked fish and curried tuna salad. 1. With a small melon baller or teaspoon scoop out a small amount of the center of each cucumber slice to make a cup. Transfer them to a baking sheet or work surface. with the smoked salmon mixture and garnish with chives. Can be made a day ahead and keep refrigerated until ready to serve.